Give your website a "facelift"... quick and affordable! Quick and easy "facelift" for your website! If you need a makeover of your website, but don't have the budget for the high-end design and development, you can still have a nice looking and effective site with my Website Makeover Package. You'll end up with a great design that works on desktops and mobile devices. You also will have the tools you need to continue adding content and staying relevant to your audience. Check out the details below. You'll need to answer a few simple (non-committal) questions that will help me decide what is needed for your website makeover and when you can expect to have it done. For a Website Makeover, you'll have a finished website in two weeks from our agreed upon start date. I will utilize your existing content to reorganize and present it in a way that will upgrade your user experience make prospective clients want to take action. Branding is not a part of this package, but you will still have the feel of a well-designed site. Once the visual magic in place, and it looks amazing on desktops as well as mobile devices, we'll launch your fresh new look to the public. You will also be given a personalized video tutorial on how to use your website and add new content. A six week email support package is also included with your makeover. Website Makeover Packages require a one-year commitment to a web care package. This will insure your site is maintained and secure. Please see details here. "What's the difference between the Website Makeover Package and the Website Design Package?". The biggest difference is the amount of time spent analyzing your content, setting up automation, and making design decisions for effective calls-to-action that get results. With the Website Design Package, you will be fully setup to begin fielding new leads and interacting with your audience so they come to know, like, and trust you. Your design will also be custom tailored to reflect a balance between your style and the audience you are targeting. 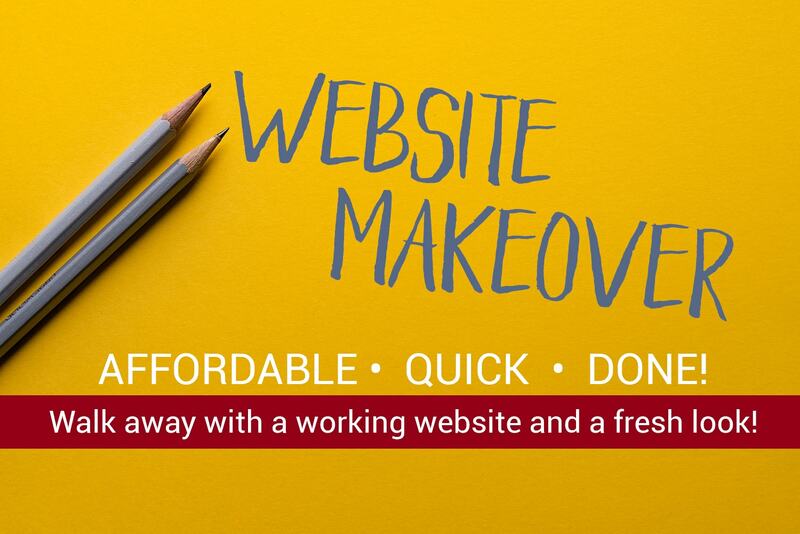 The Website Makeover Package is simply a way to allow small businesses and non-profits to get going without a hefty start-up ticket price. You will have a pleasing and responsive online presence that is ready for your business to grow and get noticed!